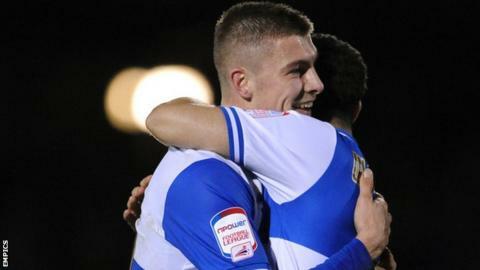 Ryan Brunt scored in injury time as Bristol Rovers beat Barnet to move out of the League Two relegation zone. Rovers broke the deadlock on 78 minutes when Fabian Broghammer fired home from Lee Brown's cross. Harry Crawford's low strike in the last minute of normal time brought the Bees level and set up a tense finish. But Brunt, who joined the Pirates from Stoke last month, drilled in the winner from a narrow angle to deny Edgar Davids's side a point. Rovers are now three points clear of the relegation zone in 19th, while Barnet slip down to 21st. "When I signed Ryan Brunt I described him as an old-fashioned centre forward. "He's got a goal in him and I'm delighted because he's only 19 but he's got a fantastic career in front of him. "It's like he's 29 - the way he deals with the situation. "He's got a very clever mind for a striker. It's a really big bonus for him to get the winner."